See inside of North West's first birthday party plus Chris Brown spends time at Teyana Taylor's single party in the pictures you shouldn't have missed this week. 1. 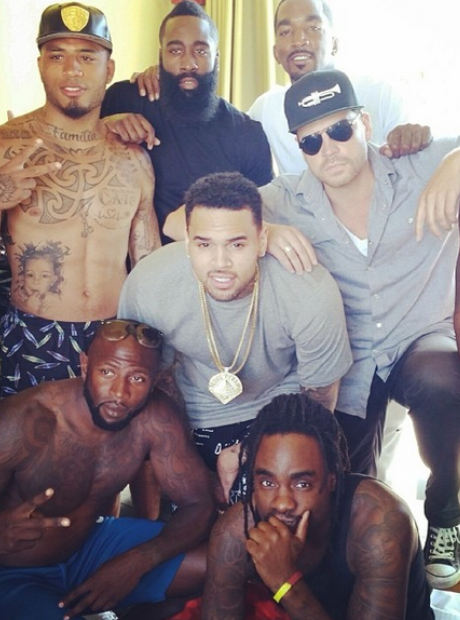 Chris Brown has been enjoying spending time with his friends and family. 5. The two performed their biggest solo and duet songs with a huge 43-song setlist. 8. This is how Disclosure celebrated the success 'Latch' is having in the States. 10. A quick outfit change and here's another shot of Rihanna's Harper's Bazaar shoot. 11. Trey Songz hit up the Dodgers game in Los Angeles. 13. In total the couple performed 43 of their biggest hits. 14. Including '03 Bonnie And Clyde' for the show's opener. 15. Nicki Minaj walked in to the studio to find all of these roses from Trey Songz. 16. And accompanying them was a really sweet note from Trey. 17. Jhene Aiko covered Vibe Magazine with this colourful shot. 18. Martin Garrix hung out with DJ Snake and Dillon Francis. 19. Kid Ink found some cool graffiti to pose with. 20. Drake posted he had "been down" but was now "grateful to be on [his] feet"
23. The one-year-old was joined by friends for the kid-themed take on Coachella. Kim Kardashian and Kanye West threw a 'Kidchella' themed birthday party for North West. 24. North's aunt Kendall Jenner performed at the party. 25. Other celebrity guests included Blac Chyna, Ciara and Future. 26. Kourtney Kardashian's back garden was turned into a huge festival for the day. 28. Beyonce showed off her natural look in an Instagram selfie. 31. Pharrell debuted a new hat whilst out for dinner in London.